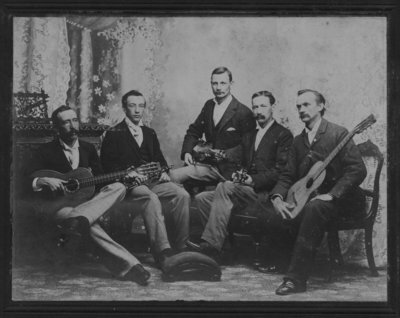 Group portrait of five men, including John Connon, holding musical instruments. University of Guelph Library, Archives and Special Collections. Copyright expired. Permission from the University of Guelph Library is required for print or electronic publication. Connon Portraits John R. Connon / Thomas Connon Collection.